2124 is best known as "the Queen of the Iron Horse Rambles." She was the first T-1 used on the Reading Company's famous excursions. Unlike 2100, 2102 and 2101 (2101 incidentally was never used on the Rambles), 2124 didn't have a second chance when the Rambles were over. With no service time left, she was sold to Steamtown USA, were she became part of the static collection. She is still part of that collection, which is now owned by Steamtown National Historic Site. Unlike many of the engines in Steamtown NHS' collection, 2124 is a truly local engine. She ran closer to Steamtown NHS than almost all other engines in the site's collection, operating primarily in eastern Pennsylvania. She was built in Reading, Pennsylvania in 1946 by a proud force of local workers. The children and grandchildren of the men who built these engines, as well as those who ran them and maintained them, are keenly aware of 2124's local significance. For more visitors than you would imagine, 2124 is the primary attraction at Steamtown NHS. Few engines in Steamtown NHS' collection have such a historical significance as 2124. 2124 is one of very few locomotives extant with a Wooten firebox. A Wooten firebox is a very wide firebox, specifically designed to burn anthracite coal and culm, the trademarks of the Pennsylvania coal region, of which Scranton is a part. 2124 is a unique example of war-time ingenuity. Designed during war-time steel shortages, when the building on new locomotives was prohibited, re-building of engines, under certain circumstances, would be permitted. 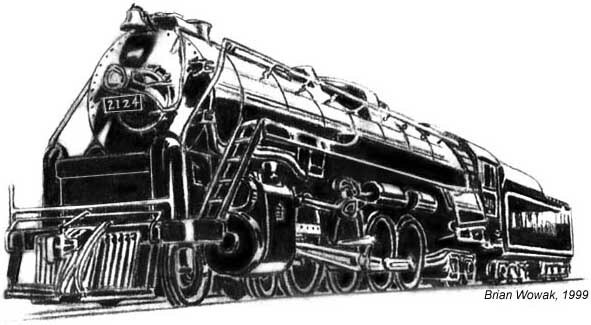 The Reading devised plans to convert an outdated class of I10 2-8-0s into modern 4-8-4s. 2124, although one of the last T1s built, was the first to return to service in 1959, when the Reading began operation "Iron Horse Rambles," steam powered excursions throughout the Reading system. She was dubbed "Queen of the Iron Horse Rambles" before her brief, two year rebirth came to an end in 1961. Since the Rambles, the other three remaining T-1s have been appearing in and out of service all throughout north america. 2100 was restored to operating condition, only to find no railroad to run on. She was sold to a Canadian rail enthusiast and freight line owner. 2101 served the entire country proudly on the American Freedom Train, and later ran on the Chessie system before being forced into early retirement by a roundhouse fire. She currently resides in Baltimore, MD. 2102, after running almost non-stop after Reading sold her, came back to the Pennsylvania coal region in 1985 and ran on the Blue Mountain & Reading until the early 1990s, when service costs sidelined her indefinitely. All of this leads to one point: There is a plethora of experience in today's steam society regarding the service, maintenance, and operation of T1 engines. When 2102 operated close to home, she was practically worshipped by Reading steam fans. Steamtown NHS can realistically expect the same response if they were to operate 2124. Steamtown has stated that 2124 is restorable, but has yet to make any committment to her. All of these facts lead to one conclusion: It is in the best interest of Steamtown NHS, the railfan community, and society at large, to restore 2124 to operable condition. For Steamtown NHS she would undoubtably boost attendance. The railfan community would have a large 4-8-4 operating on a predictable schedule. And society would have a vehicle for teaching the varied and colorful history of the Reading Railroad and the Pennsylvania coal region.